We are taking advantage of the teachers' conference in New Jersey; we came to Los Angeles to visit some colleges for Murat and to spend some time with my precious nephew, Prometheus. This is the first time my husband is coming to the west coast so I want to make sure we show him a good time as well. 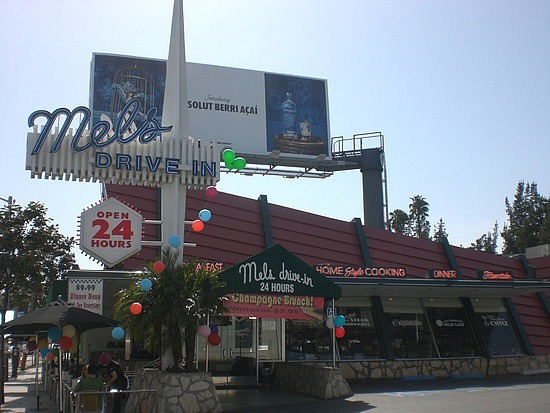 We started out our first day with our traditional breakfast at Mel's Diner on Sunset. This was the first place, my brother, Cenk, took us to when we visited him here many years ago and it has been Murat's favorite ever since; he especially loves their Oreo Milkshakes - I can't blame him, they are definitely out of this world. I think this is one of the best places to start a trip to LA; it looks like a typical scene straight out of something that you see on the screen of people discussing new projects and making lists on paper napkins as they have breakfast in sixties type of booths while a waitress pours them coffee. The oddly familiar look of the buildings is something that hits you as soon as you start to drive around LA. Cenk tells me this is due to the fact that so many movies have been shot here... makes sense, since all they would have to do would be to just walk out into the street.